Are you curious about eye color or the hair on your knuckles? We will learn about genetics! Are you curious about Anthrax or Ebola? We will discuss bacteria and viruses! Are you curious about life? We will understand cells – and what makes them tick! Are you curious about fall colors? We will explore photosynthesis! 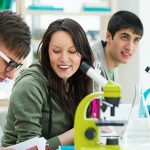 This Biology course is intended for high school level students covering topics on life and biology including: Cells, taxonomy, scientific method, chemistry of biology, genetics, embryology, bacteria, viruses, creation vs. evolution, biosphere, photosynthesis, invertebrates, vertebrates, plants, ecology, etc. Students will learn and submit formal lab reports as assignments on labs chosen by the teacher. Labs will be graded. Students will perform labs at home with teacher direction as well as virtually – students will have required lab reports on these labs also. Importance will be placed on students’ understanding of scientific inquiry, the scientific method, and the resulting science lab reports. This online course is delivered entirely online using Adobe Connect for our live class meetings and the Powerschool Learning Management System (LMS) for all other course interaction. This class contains synchronous (live) and asynchronous (anytime) components. Active participation is essential for maintaining the best learning environment. It is also a fun part of learning. Students are not required to attend the Biology classes live, but students who do are expected to engage with the teacher and with each other. Outside of live sessions, students are expected to log on and visit the class pages to see and contribute to new content, activities, or assignments. There, students may review class material, keep up-to-date on announcements and assignments, and verify that there have not been any changes to the class calendar and/or agenda. Weekly assignments will be posted the Saturday before class for easy planning. The Internet may be used in the class to supplement course content and may be accessed by the teacher during live class lectures or by the student outside of live class meetings for general research or for additional information from such government, organizational, individual, or commercial sites that may be beneficial to learning. So, parental supervision and participation in the learning process is strongly encouraged.